Wang Xianxiang, 42, get power no be small. 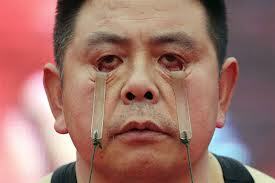 But na em eyelids em power dey, I suppose. 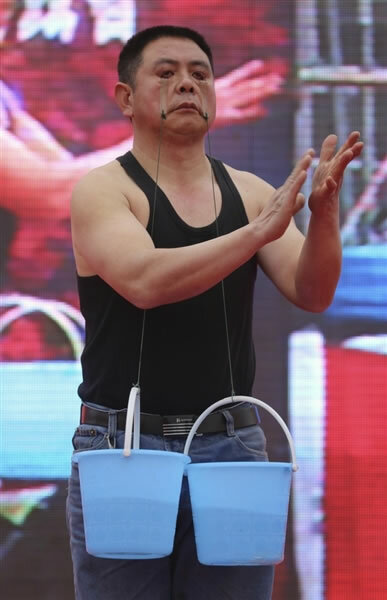 Wang get a unique way of carrying buckets of water: with em eye lids! From the central Chinese province of Hunan, Wang na fireworks maker. The two water buckets get combined weight of 9 pounds and he carry am with em eyelids for a minute. Lakunle, where do u get these things ?is this reAl? My broda/sis, Anonymous, I must say, your thought process dey perfect. To add to it, if the guy na Chinko, or japanese or even Korean, their time don come. Dem dey perform in all spheres of life. A country wey get a population wey pass billion, wetin we expect. Strange ones suppose plenty. Apart from that, the competition dey stiff. everyone dey try to surpass the other in exploit you know. Naija dey rise!